ONI Bureau: Two major things happened today in Indian politics today. While one of these events can be dubbed as a mere poll survey, the other one may change the political discourse in India. 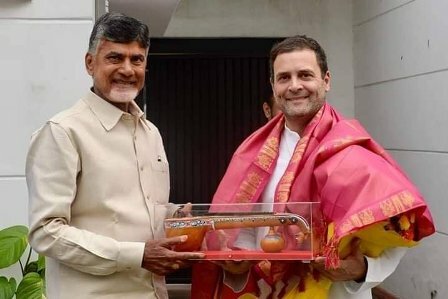 Andhra Pradesh CM N. Chandrababu Naidu who had dumped the BJP a few months ago, has embraced his bitter rival Congress when he met Cong President Rahul Gandhi in Delhi and gifted a ‘Veena’ and ‘Chaddar’. Both Naidu and Rahul hinted that their set aside all differences and past rivalry for the sake of opposition unity. It can be recalled that Chandrababu Naidu always maintained that Congress had betrayed the people of Andhra Pradesh and fought the party for decades in the state. Although BJP has little presence in Andhra, Naidu had no option but to seek Congress’ support as the saffron party is all set to join hands with Jagan Mohan Reddy’s YSR Congress, which is gaining strong in the state. It would be interesting to see how Congress-TDP alliance fares in Andhra Pradesh and whether it would have a real impact on national politics too. The C-Voter Survey in association with ABP News, has predicted 300 seats for the BJP-led NDA in 2019 polls, saying they would win 70 out of 80 seats in Uttar Pradesh alone, followed by 34 out of 40 in Bihar. The survey has given 300 seats to NDA, 116 to Congress-led UPA and 127 to others. NDA would get 38% votes, while UPA would get 25%, it says. BJP is tipped to win 9 (42) seats in West Bengal, 12 (21) in Odisha, 17 (25) in Rajasthan, 23 (48) in Maharashtra and 22 (29) in Madhya Pradesh. However, the survey says if Samajwadi Party and BSP join hands in Uttar Pradesh, NDA’s seat count would come down to 261 – well below the majority mark. Congress won’t gain more and may end up with 119 seats. However, others would go up to 163 nationwide. In case of a Mahagathbandhan in UP, SP-BSP alliance may win 44 seats, leaving just 31 seats to NDA and 5 to UPA.